Add "supergroup" to her already extensive resume. 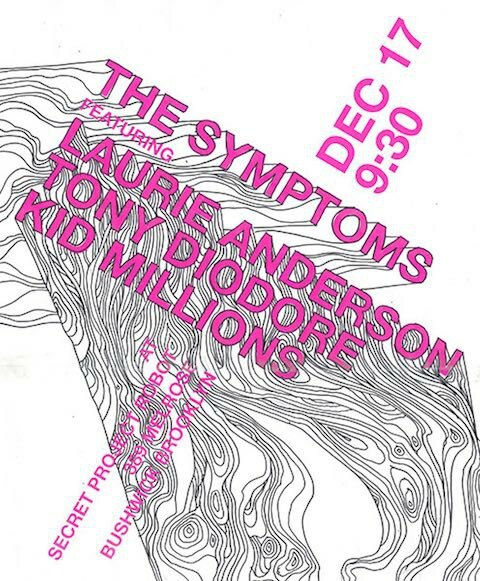 Laurie Anderson, the artist/documentary filmmaker/electronic music pioneer, will be performing alongside Jon Colpitts (aka Kid Millions) and violinist/guitarist Tony Diodore (who played with Lou Reed) at Secret Project Robot on Thursday December 17th. Collectively, they are The Symptoms. In addition to music, Anderson's Habeas Corpus' art installation made its U.S. debut at Park Avenue Armory and her film Heart of a Dog, about the loss of her was released and is on track to win Best Documentary at the Oscars. Secret Project Robot, the experimental non profit, recently opened Flowers For All Occasions on the Bushwick/Bed-Stuy border. The Symptoms, Thurs. Dec. 17 @ Secret Project Robot, 389 Melrose St., Bushwick. 9:30-11:00 pm. $15. Tickets available here.